Assistant coach Jason Retz took a moment to pause when asked about his team finally getting back to the mountaintop for the first time since 2000. "Well we have been knocking on the door the last few years with a second and third place trophies," said Retz. The Spartans set the stage tone in the first event of the day when freshman long jumper Atleigh Hamilton moved from fourth to first with a stunning leap of 18-2, enabling her team to go on to score 43 points. SJO won only one relay but scored in three others. They took the 4x200 in a classification best 1:43.89. It was enough to turn back Farmington 36 and Decatur (St. Teresa) 35. This is the first championship for head coach Kelly Steffen who was an outstanding athlete at Bloomington HS and later in college for Indiana State. Shot Put fans had been waiting patiently for Fulton junior Chloe Lindeman to unleash the same amazing performances like she did during the indoor season. Lindeman's performances were in the low to mid 40-foot range until Saturday. She broke out and dropped a state-leading 47-3.75. Daelin Switzer (Jr., Decatur St. Teresa) and Danielle Taets (Jr., Orion) battled directly and indirectly throughout the day. Switzer won her third consecutive high jump title with a personal best 5-8. She would later win the 300H in 44.49. Taets placed third in the long hurdles but was victorious in the triple jump (38-0) and 100H (14.72). 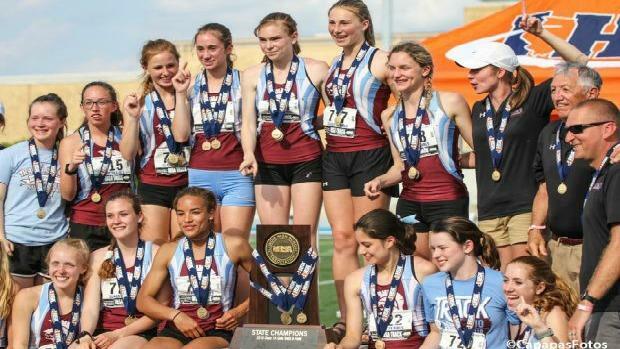 The distance battle between the veteran Arielle Summitt (Sr., Urbana University) and Marianne Mihas (Fr., Chicago Latin) turned out success for both standouts. Summitt won the 800 unopposed in with a sizzling personal best 2:11.03. Mihas did not advance from Thursday's prelim round; she was able to settle down and ready herself for the 1600, where she would face Summitt. It was a hard fought battle in which Mihas was on the ropes of defeat inside the final lap, but she was able to muster up enough strength and kick to hold on for the victory over Summitt 4:56.29-4:57.98. With the absence of 100 and 200 favorite Bella Uscila of St. Edward, it was an opportunity for Peoria Heights sophomore, Seven Hicks, to shine. Hicks breezed through her prelims in 12.42 and 25.78. The Century final was fast. Hicks ran 12.21 and later 25.50 in the 200.